Software-defined architectures have transformed enterprises to become more application-centric. With application owners seeking public-cloud-like simplicity and flexibility in their own data centers, IT teams are under pressure to reduce wait times to provision applications. 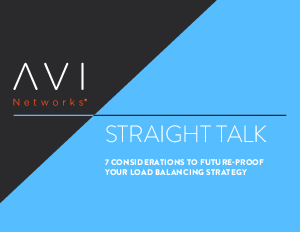 Legacy load balancing solutions force network architects and administrators to purchase new hardware, manually configure virtual services, and inefficiently overprovision these appliances. Simultaneously, new infrastructure choices are also enabling applications to be re-architected into autonomous microservices from monolithic or n-tier constructs. These transformations are forcing organizations to rethink load balancing strategies and application delivery controllers (ADCs) in their infrastructure.